Recently wrote a blog post about the many crafts I’ve done through the years and realized I’ve also gone through an extreme number of non-craft hobby “phases,” too. Am always on the lookout for new and interesting athletic endeavors and activities to try, too — so there will be more! 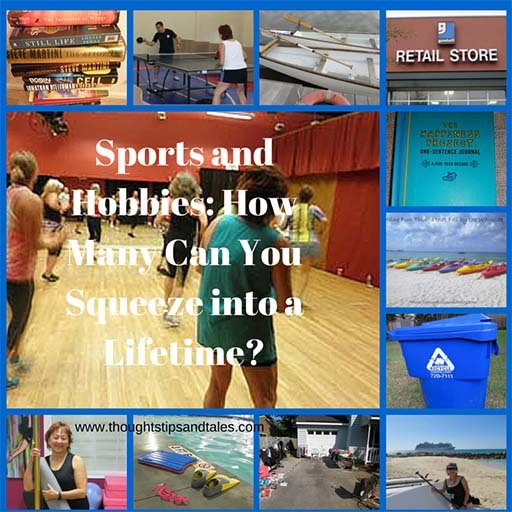 What sports and hobbies have you done? What are your favorites? And what do you want to try next? Here’s a list of 308 everyday hobbies you might want to dive into…as well as a peek into some celebrity hobbies. This entry was posted in fitness, hobbies, sports and tagged fitness, hobbies, sports. Bookmark the permalink. Your ping-pong adventures are really funny!